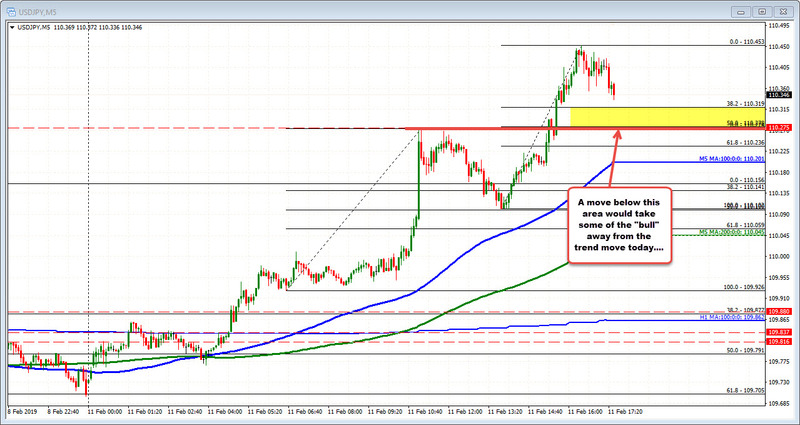 USDJPY slows its rise a bit as stock rise slows as well. The USDJPY rise has slowed a bit. Stocks are becoming more mixed with the S&P near unchanged, the Dow down marginally (-0.13%), but the Nasdaq still up marginally as well (+0.22%). Drilling to the 5-minute chart above, the pair peaked at 110.45 (so far). The last leg higher today took the price from 110.10 to 110.45. The 38.2-50% of that leg higher comes in at 110.278-319. A move below that level would take some of the "bull" away from the trend move higher today (the hihg from London morning reached to 110.27 before correcting so that level is important for intraday trading). Taking a broader look at the daily chart, the price moved above 110.37 (and trades near that level now) on it's way to the high at 110.45. The 110.37 was a swing low from September 2018 before trending higher to the 2018 high at 114.54 (it tested the 100 day MA at that time). That level is a barometer for bulls and bear. Watch it now as the market tries to figure the next move. From the same chart, a move back below the 110.12 would tilt bias even more to the downside. 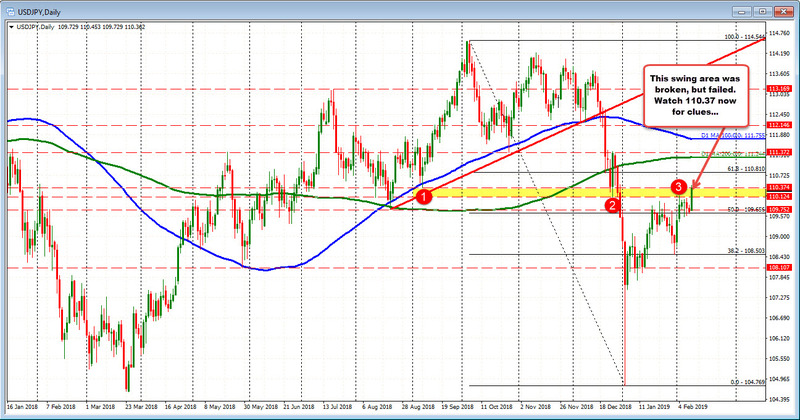 Overall, it is hard to pick a top, but with stocks coming back the USDJPY has lost some mojo. The 110.37 may be a barometer for traders. ON the downside, a move below 110.27 and then 110. 12 would tilt more of the bias back to the downside.